@jynxx1970 The lower pic where the Rubi is deep in muck, where was this pic taken? Our Jeep club just went over Hunter on 3/18 and we didn't encounter anything like that. We all made it from north to south and joined Saline Valley Rd with a mix of stock and modified Wranglers and a mix of driver experience. We did have a Subaru Forrester that came up behind us get stuck just passed Quail Springs (high centered on some deep snow), but we only had to pull him about 50 yards and he made it the rest of the way without incident. So Cerro Gordo to San Lucas Canyon was a walk in the park. A few rough spots but pretty much a breeze. As noted, Hunter Mountain is in great shape. Lippincott Road was also in great condition and a breeze as well. @OpenTrackRacer, my buddy went down from Cerro Gordo onto to white mtn talc road out through Lee Flat back in July and said it was good shape. PS- Drove my double cab Tundra up it Nov 14' when it was supposed to be in pretty bad shape but only used the sliders a couple of times. Just came back from Lippincot and the Racertrack through Hunter Mtn. Hunter's been graded from SV Rd to the summit and down the other side. Hunter Mountain is kind of a mess. I tried it yesterday from the south and wound up turning around about 1/3 of the way to Teakettle Junction from Saline Road. 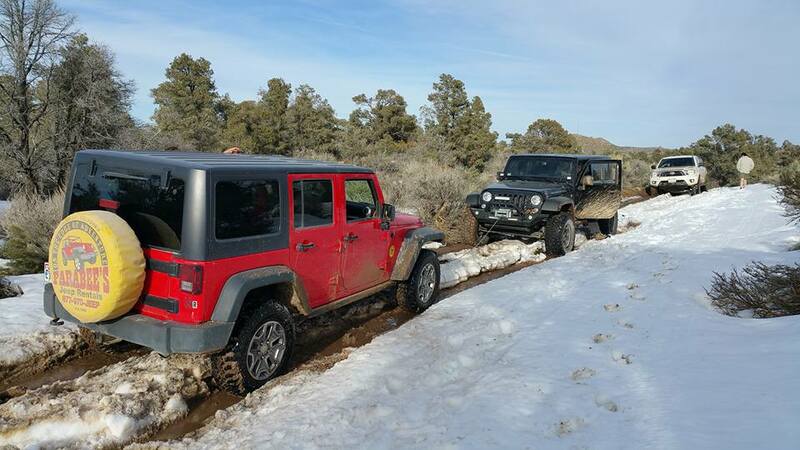 Lots of mud, snow and ice. I would have been inclined to finish the trip if I was with other vehicles with recovery gear options, but not solo. I have found no pertinent post to date regarding the condition of Big Pine Road from south Eureka rd over the mountain to crankshaft junction. our group of Xterras will try this over the Veterans day week. looking for feedback prior to Saturday. I camped over the weekend at Ballarat and talked to some campers. They said that Grapevine and Scotty's Castle is still flooded and closed. Sunday I traveled the Panamint/Trona road to Hwy 190 ending up at Panamint Springs. Wildrose road is closed with barriers blocking the road. Prior to Wildrose road from Ballarat there is a three mile section of graded dirt road. The black top is gone and the speed limit there is posted 35 MPH. At that speed a lot of dust is blown. If a car is 100 yards in front of you its a black out drive from the dust. When I had just come out of the dust road I saw a convertiable with the top down going on to the road. Bet he really got dusted. I went up Lippencot and out over Hunter a week ago today. Lippencot was the usual, rocky in the middle section with one off camber section where a lot of dirt has drifted down. The silt pit in Hidden valley was a real bog and it looked like I was the first up Hunter since the last rain, no tracks in the road at all and lots of rock and junk was on the road. There were a few washouts in corners that took some road away but I got around ok. Lots of mud bogs once on top near Hunter cabin. It was doable but a challenge. I drive a lifted, locked, 2001 Xterra with 33/10.5/15 BFG mud terrains. Also came in over Steele pass and it was fine until the upper springs and the road to the middle springs is just gone, tracks everywhere that just disappear, took several hours to finally make my way to the springs. Quit a challenge and I've gone in and out this way at least 9 or 10 times. Also did Echo canyon and it was in great shape, my first time up the falls as I've always come down them. Anyway Hunter was doable but the most challenging I've seen it, depending on what you're driving and your skill level and if you're with anyone else. It is quit possible that the mud bogs would be the most problem. Sounds like massive road flooding in Death Valley proper and points east. Swift water rescue on the Amargosa. Almost all access to the park closed right now. Not clear how many points are things that will be cleared up in a few days and how many will take a lot longer. Radar coverage over SV is poor, but there was a significant cell near South Pass last night that appeared to move over Hunter Mountain and Racetrack Valley. Also looks like Eureka Valley may have had a cell over it. Last night the northern sections of Death Valley National Park were hit with severe thunderstorms and heavy rain. The storm specifically hit the Scotty's Castle and Ubehebe Crater area. Eight vehicles full of visitors and three park rangers were stuck in the Ubehebe Crater area overnight. All individuals are fine. We do have a plane flying today to search for any additional visitors that may be stranded in the park. Death Valley has received over one year's worth of rain over the past 14 days. All roads within the park except CA 190 and NV 374 are closed. Over 1,000 miles of road are closed. Millions of dollars in flood damage will take months to repair. There is no estimate on any opening times and or dates at this time. The current priority is the safety of park visitors and staff. This just in. The only way from Vegas to Death Valley is from I-15 up through Ridgecrest/Trona area. Flooding continues. The closures may be in effect for some time. This is a serious incident. White Mtn Talc Rd-Cerro Gordo Rd (up to town) loose w/only minor spotting needed-reports of road blockage were not discovered-only hit sliders once. Greenwater & Deadman's Pass smooth/ fast trails very little wash board.